While everyone is going curved, Sony has decided to throw a wedge in the mix. The tapered design of the company's 2014 Bravia X9 4K line serves a distinct purpose, and not one that has to do with visuals. Instead Sony has used the extra real estate that fatter bottoms afford to stick in a better set of speakers. In press pics the result is a Swiss-cheesy wedge look, but in person the triangular sets are sleeker than they'd seem. We checked out the X9B line - comprised of the 55-inch XBR-55X900B, the 65-inch XBR-65X900B and the 79-inch XBR-79X900B - here on the CES show floor. How you wedge me now? As Sony reps explained, the new wedge shape of the Bravia X9 line aren't just for show. The wedge fits larger speaker cabinets, meaning much more oomph. The result is a sound-explosion while also giving the TVs a distinct look. From straight on the wedge shape is hardly noticeable, but once you start to move to the side, wedged-ness appears. It's by no means obstructive - these are flat 4K screens and the viewing angle is the same as it would be on any such screen. Sony has made the sides from a mirrored material, so you can see slivers of reflections. This appears to give the TV more breathing room as it lacks a hard-lined border. With our eyes glued to the 3840 x 2160 screen, we didn't find movements caught on the sides distracting. It may be problematic in a well-lit room, however, with the potential for living room lights glinting into the eyes of those sitting to the side. We were told that although a tapered look would lead one to think the TV is wider, the Bravias aren't any wider than a comparable set. Indeed, there wasn't a huge sense of bottom-heaviness. The models on display were on stands, but customers won't need to keep their TVs on its thin legs - the Bravia X9s can be fixed to walls with a tilt mount or articulating wall mount "just fine." The stand, by the way, is smaller thanks to the TV's wider bases. Sony's reps were tight-lipped on exact specs for the speakers, but did reveal that they are Sony-made. They come in 3 different sizes and are stacked in descending diameter, and serve as unique accents to the TVs' overall look. 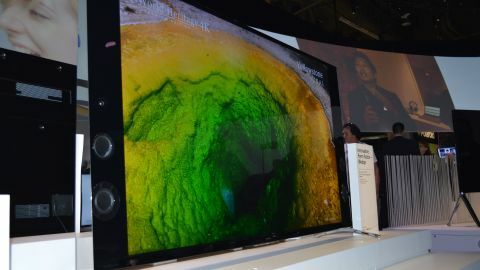 The Bravia X9's feature integrated subwoofers, and in a demo booth inside Sony's main booth, we could feel their bark. One side of the booth was lined with sound absorbing material, so it wasn't quite like listening to the game at home, but the result was ear magic. The speakers provide a surround sound experience that's engulfing. Likely thanks to Sony's own audio tech, the various demos were crisp and very high-quality. As for the 4K screen itself, there were no flaws we could find. The X9s feature something called X-tended Dynamic Range, which increases the range of contrast by 200%. Blacks don't black out, and brights aren't faded. The screens were a pleasure to look at, and certainly on par with 4K offerings from other manufacturers. While we couldn't watch the tube on the show floor, one new feature found in the Bravias is called One-Flick Entertainment. A small (also wedged) One-Flick remote will accompany the X9 sets, and its functions are pretty basic. It's essentially a way to scroll through TV shows, movies, YouTube clips and content from the likes of Crackle with minimal, flicking finger movements. Flick up from the central home button, and content sources appear along the bottom while whatever you were watching continues to play unobstructed. Flicking to the left or right will land viewers on different program options, and pressing down on the main pad selects them. Clicking on the home pad initially pulls up a guide that takes over the screen. It's pretty basic, and once you get the hang of the controls very responsive. It truly took the slightest of movements to move around. There's nothing revolutionary about this set up, but it's a nice touch, albeit one that means users will have another remote to keep track of. We found the composition of the 4K Bravias truly compelling - a beautiful, crisp 4K screen matched by high-power speakers. The design is unique in a sea of TVs trying to be the curviest. Curves serve a purpose too, but the benefit of a wedge with better speakers is immediately apparent. The look may not be for everyone, but the sound should be. There is one major question left unanswered, namely how the X9s actually fit in the home. As for price, we were told that the 55" and 65" ($2,999.99/£4,000 and $3,499.99/£5,999) models will be equal to or less than their 2013 brethren in price, though nothing is so clear for the 79". Those are prices that are still outside many folks' budgets, but the one-two punch of a great screen and even better speakers may be well worth it.